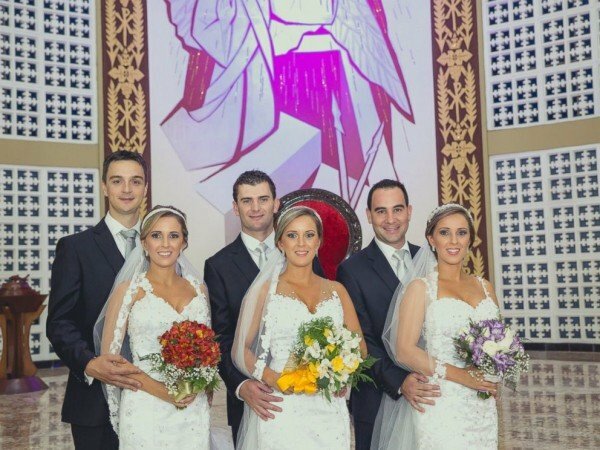 Brazilian triplets Rafaela, Rochele and Tagiane Bini fulfilled their childhood dream of walking down the aisle together in a joint wedding in Rio Grande do Sul on March 21. They got married to their respective husbands together at Catedral Nossa Senhora Aparecida in Passo Fundo, Brazil. The 29-year-old identical triplets appeared in the same white mermaid gown, with identical hairstyles and matching veils. The only distinction was the color of their bouquets. The sisters has done everything together since they were young, and dreamed of getting married on the same day. Their father was beaming as he gave them away. “We walked together to the middle of the aisle and from there, I walked each one down the aisle individually,” said their proud father Pedro. The brides spent six hours at the salon getting hair and makeup done. There were 18 groomsmen in attendance, each wearing different colors depending on which wedding party they were with.